We all wish for a life that has meaning, one that connects us more fully to the people in our lives and to the larger community. 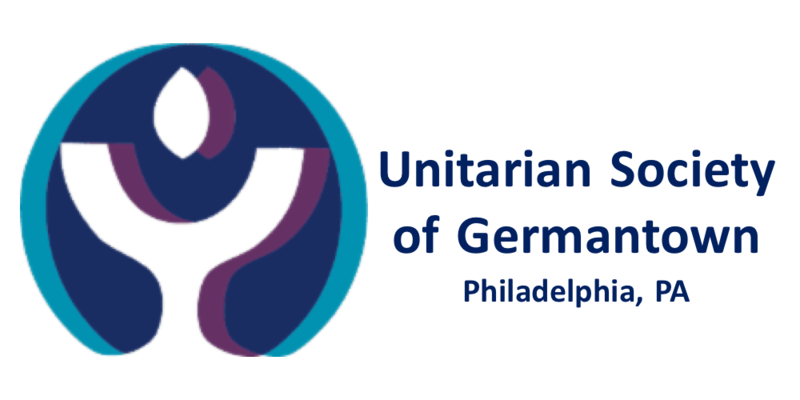 Within the Unitarian Society of Germantown, you will have support in creating that more meaningful life. Within this supportive, caring community you have rich opportunities to develop spiritually and socially in addition to working for justice. Membership at USG means making a deeper connection to your faith community. We encourage you to learn more about our principles and purposes through reading, worship services, classes, and discussions with members and our minister, the Rev. Kent Matthies. Attend a Membership Orientation, which is 45 minute overview and discussion of what it means to be a member of USG, generally held on the second Sunday of the New Member Signing ceremony months: January, April, July and October. New members participate in a brief ceremony during the worship service and sign the USG Records Book. There is no creed you must accept. We receive people into membership during a New Member Ceremony in the worship service several times throughout the year, generally the fourth Sunday of January, April, July and October. For more information about the membership process, please contact Lisa Dutton or Treva Burger, co-chairs of our Welcoming Team at welcoming@usguu.org or Treva via phone at 215-277-5752. Joining our congregation brings with it commitments. A community is only as strong as its members and that strength comes from participation, service, gifts of time and money, individual growth, and caring and support of each other. Membership at USG involves mutual commitment. Our church community seeks to be inclusive of all ages, races, ethnicities, gender expressions, sexual orientations, abilities, and economic circumstances. We encourage and honor a variety of theological perspectives including Atheist, Agnostic, Humanist, Christian, Jewish, Buddhist, Hindu, Muslim, and Earth Centered traditions. Our spirituality draws from scripture and science, nature and philosophy, personal experience and ancient tradition. Our minister preaches 3-4 times per month. Guest ministers and lay people share the pulpit on other days. We have an professional music director, an excellent choir and numerous talented musicians. There are also intergenerational services throughout the year that offer inspiration and worship for all ages together. Our congregation supports and cares for members during difficult personal passages. Pastoral care provided by ministers and lay leaders includes home and hospital visits and other supportive assistance. We also provide rites of passage such as baby dedications, weddings, and memorial services. You will be urged to strengthen and celebrate your spirituality, and supported in your search for truth and meaning. Through a variety of classes and groups, you will have opportunities to broaden friendships and deepen understanding as you learn about a range of spiritual practices and topics as well as Unitarian Universalist theologies, history, and identity. If you have children, USG offers an environment and programs that will support them in their own searches. UUs are called to serve our congregations and to help make the world a better place and we have many, many opportunities to serve both the church and the greater community. We have social justice teams working for better public education and economic justice, more just immigration policies, toward ending racism, mass incarceration, and homelessness, among others. We host a large MLK Day of Service each January and promote numerous different projects and events each month. Communal worship is extremely important to the life of our community. If you do not partake of it often, you are less likely to feel connected to the spiritual heart of the congregation. We believe that each of us is capable of discovering religious truth as it is revealed to us in our lives and within our faith community. With the support of the congregation, we each take responsibility for our own spiritual well being. We ask only for an identifiable monetary gift (your name on a check or envelope) from members each fiscal year on a schedule of your choice. Give until you feel good, and know that your contribution, whatever it may be, sustains our spiritual home. Many church tasks and activities are done by members. We welcome your time and talents to help USG in its mission, whether in the classroom, the office, the building and grounds, the worship services, the kitchen, on committees or on the Board of Trustees. We practice congregational polity, which means that members are our congregation’s final authority. Your participation to help build our faith community is important and appreciated. Acts of caring are also an essential part of belonging to a faith community. We care for each other with meals, rides, help at home, cards and pastoral visits. We express our beliefs through our actions. USG provides many opportunities for social justice work. You will be encouraged to become deeply aware of and involved in local, city, state, national or international issues.